I’ve been false nails obsessed recently, especially since I discovered the nail guards which means minimal to no damage when I’m wearing falsies (See post here). 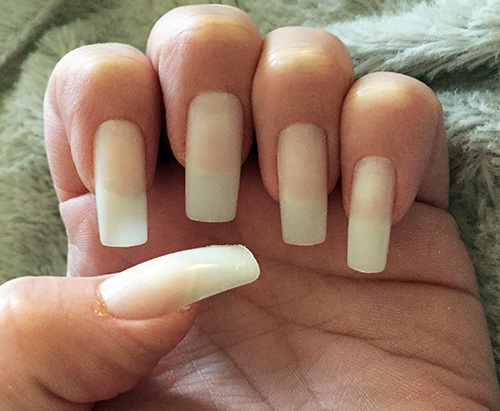 Deciding for a shape change I saw the Broadway Nails Natural Nails Square Kit and liked the look of it, so here are my thoughts for you on the kit and how I found it. The Broadway Nails Natural Nails Kit provides you with artificial nails which are easy to apply and give you nails which look natural and healthy. So, yes I do know what I’m doing when it comes to nails and I guess I do have that step up from the average consumer. However at times I don’t want to do a full set of acrylic or gel nails on myself (Its time consuming) and can’t be bothered to pay someone else to do it (Hello! Why pay someone else when I can do it – if I could be bothered), so recently false nails has been something I’ve been reaching for a lot. I’ve reviewed a few brands and types now and the Broadway Nail range isn’t something new to me. I’ve tried their nails before and found them to be good quality, plus they lasted well. The set comes with pretty much everything you will need although I always use my own files and cuticle pusher, just because I prefer them. With this kit, you also get some pretty nail stickers too although I didn’t use this as I knew I’d be painting these nails. 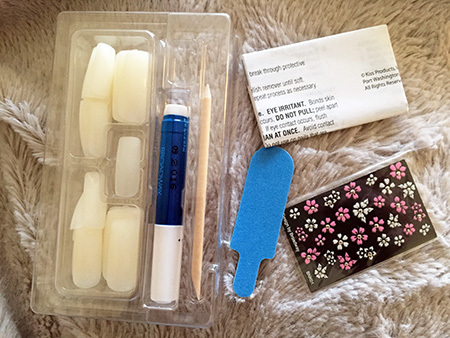 I also apply nail guards before I apply the false nails to protect my nail bed, it also means its a bit easier removing the false nails after and there’s no nail glue coming into contact with your nails either, so no buffing or filing when you move them. I really recommend nail guards if you do wear false nails!! The process of applying the Broadway Nails Natural Nails Square Kit varies in honesty. I usually watch a couple of episodes of something (Vampire Diaries or Scream Queens at present) but admit I’m somewhat distracted and take my time and paint my nails after too. However, you can pop a full set on in about 10 minutes easily if you want. 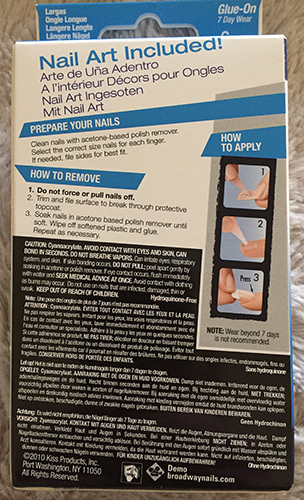 The great thing about this kit is the glue, this glue has a pink tone to it, so it gives the nails a more natural appearance on your own nails. This doesn’t really matter with me as I paint them anyway, but if you wished to leave them bare its an option. Lasting wise I got 10 days wear with these and didn’t break any. However, I could have gone longer. As a rule most false nail brands recommend no more than 7-10 days wear before you remove them and I tend to agree. To remove them is pretty easy too and there’s full instructions on how to do it with the kit. I do it a little differently but that’s because I use the nail guards and also don’t use acetone or nail polish remover to get them off (I use rubbing alcohol or surgical spirit as its also known which is what I use to remove the glue bonds on my tape in extensions). I adored these Broadway Nails on, they look immense and SO LONG!! In fact if you want me to be really picky, these were too long and I had to file a good few millimetres off of them. I know the trend at present is the long square (Think Kylie Jenner) nails, but these were so long I couldn’t use my iPhone – so bare in mind you may need to file. The sizes were good though and will fit most peoples nail shapes which was good. Over all, these Broadway Nails are a great set of false nails. They look natural, are long and strong. The glue is brilliant and were easily removed. These will be great for the party season and at under £8 you can have a great set of looking nails which look professional and will be perfect at Christmas time – I highly recommend them! 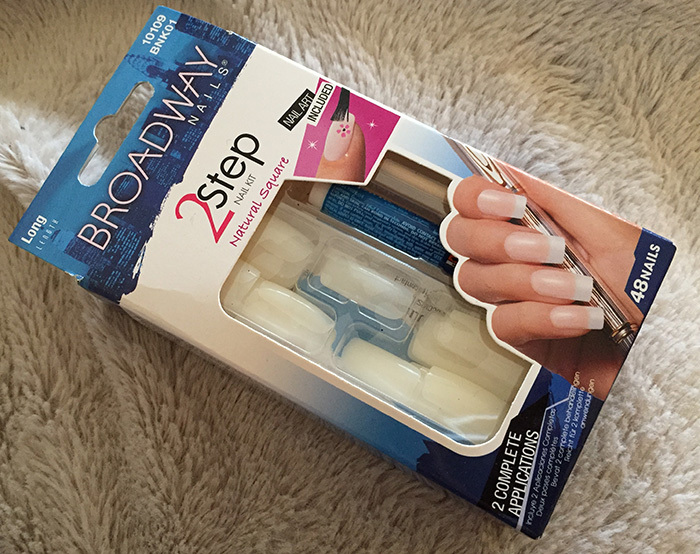 The Broadway Nails Natural Nails Square Kit is available at Boots and some online retailers. It costs £7.15 and contains 48 nails (You should get 2 if not 3 sets out of this kit).